Rated 5***** on Trip Advisor, your Kimberley off-road tour will start when we pick you up from your accommodation at 6am and begin our journey by making our way to the Gibb River Road. Our first stop will be at the impressive Derby Prison Tree before continuing on to Windjana Gorge where your guide will tell you stories of Jandamarra and the Bunuba resistance. Afterwards, we will visit Tunnel Creek before making camp. Today our Kimberley off road adventure will start with a visit to the remarkable teared waterfall known as Bell Gorge in the King Leopold Conservation Park where you will have the opportunity to swim. In the afternoon we will swim at either Galvans or Adcock Gorge depending on the seasonal conditions. Our last stop for the day will be our bush camp. 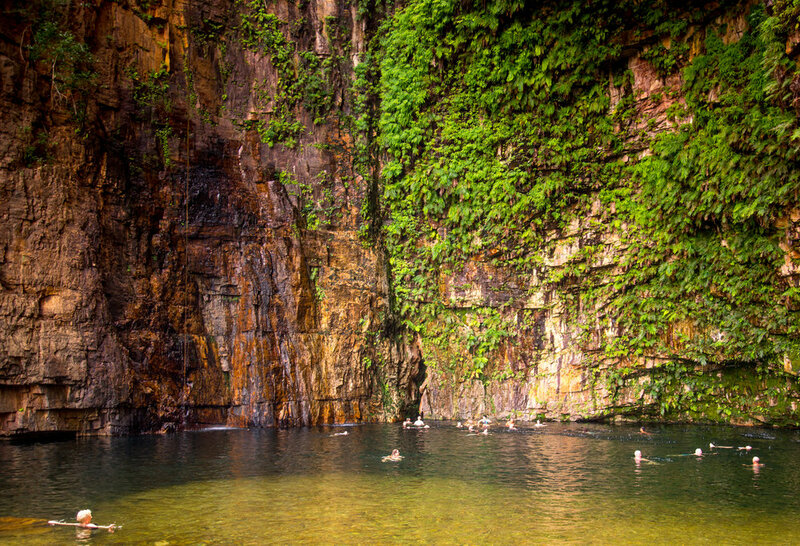 We start the day with a hike into Manning Gorge where you can swim as well as see the ancient Kimberley Bradshaw rock art and spot the Northern Red-Faced turtle. We will then continue along the Gibb to our camp, taking some mini off-road diversions to see rock art sites and lookouts along the way. Highlights: Manning Gorge, Bradshaw rock art paintings and travel the Gibb River Road. Today your 5***** Trip Advisor tour will cross the Kimberley's Pentacost River and make our first stop at a series of crystal clear hot springs known as Zebedee Springs, where you can relax before embarking on an adventurous hike up El Questro Gorge. At the top you will be rewarded with a refreshing swim. Tonight we will stay at the famous El Questro station, where you can quench your thirst at the Swinging Arm Bar and rub shoulders with the locals and fellow travellers. 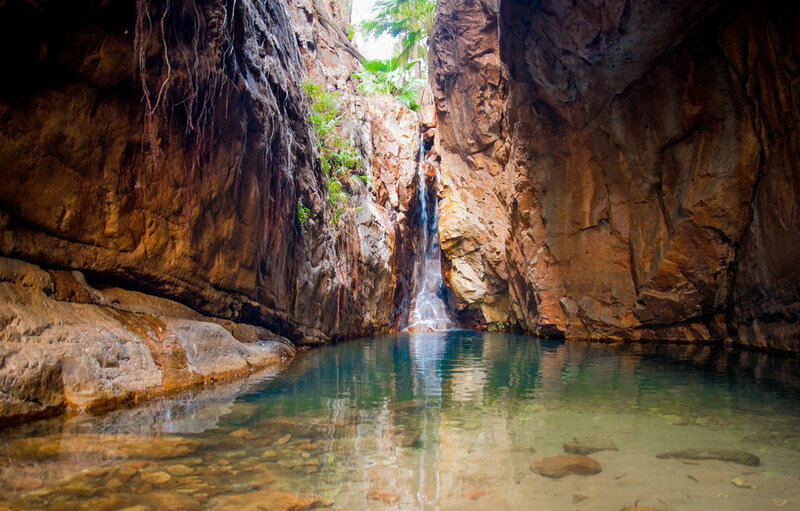 This morning the Kimberley adventure continues with a hike in to the Cockburn Ranges to Emma Gorge where you will be able to swim in the cool waters. We will then make our way to the Bungle Bungles and visit Echidna Chasm and Mini Palms Gorge before setting up camp in Purnululu National Park (Bungle Bungles) in the Kimberley. Today we hike to Cathedral Gorge as well as Whip Snake Gorge, the Window and Piccaninny Creek Lookout, all in Purnululu National Park (Bungle Bungles). You’ll also have the option to go on a helicopter flight starting from $269 for an 18-minute scenic flight. Afterwards we will head to our campsite. Highlights: Whip Snake gorge, Cathedral gorge, the Window, Piccaninny creek and an opportunity to to ride in a helicopter. This morning we make a stop in Kununurra before heading on to Lake Argyle, Australia’s largest manmade lake, where you have the option of a cruise (approx. $40). We will then venture on to our campsite. Highlights: Lake Argyle, Carr Boyd Range and Durack Ranges. Today we will visit Gingers Hill in Keep River National Park and learn about some of the local aboriginal history. We will then cross the border into the Northern Territory and make a visit to Jubarra (Gregory) National Park, where you will see Gregory’s tree before we move on to the Victoria River region to find some rock art and set up camp for the night. Highlights: Keep River National Park, Gingers Hill, rock paintings, Victoria River and Gregory National Park. 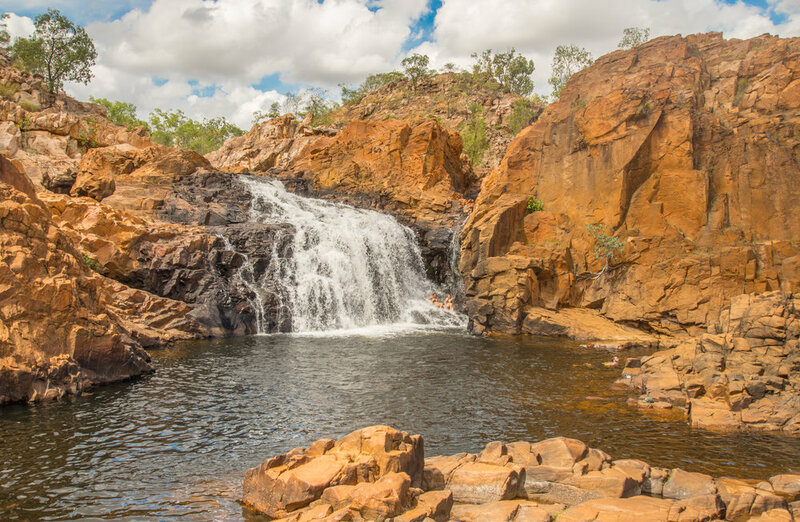 On the final day of the Kimberley off-road adventure tour we will take a dip in Edith Falls for a refreshing swim before making our way to the capital of the Northern Territory, Darwin. On route we will stop at the intriguing Magnetic and Cathedral termite mounds before dropping you off at your accommodation in or near the city. Highlights: Katherine Gorge, Edith Falls, Cathedral & Magnetic termite mounds and Darwin.